Rise and shine, nightstalkers. The sun is up. We're up. And you're about to be put down for good! Avengers: the bloodthirsty, incensed, outraged and self-righteous among hunters. What makes a normal person go toe to toe with monsters-and win? Insanity? Divine blessing? Driving will? Just ask. Then again, you may not get an answer. Actions speak louder than words. 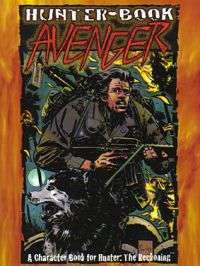 Hunter Book: Avenger is the first in a new Hunter: The Reckoning series dedicated to the creeds, the character types of the imbued. Learn Avengers' philosophies, motives and ultimate goals in the war against the supernatural. Avengers may still be human, but all these new Traits, edges and rules sure even the odds. Yell real loud and swing a big stick.